We clean out and fill cracks over 1/8th inch wide with Hot Rubberized Crack Filler. 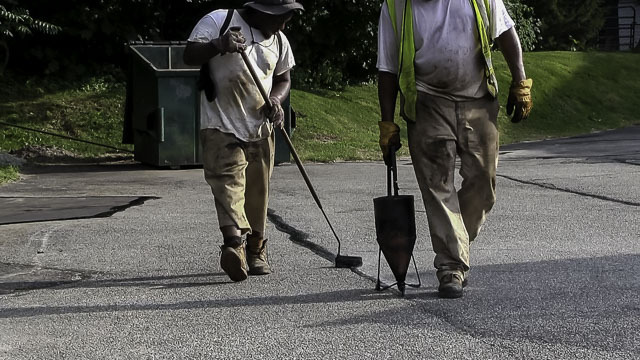 If the cracks are filled, you can prevent water from undermining the pavement. When water freezes and thaws it can break the surface pavement and cause future potholes and extensive asphalt damage. We use a specialized squeegee to force the hot crack filler into the cracks deeper. This will help glue the walls on the inside of the cracks together.By not using a squeegee the material will tend to bridge over the cracks and will re-brake more easily.